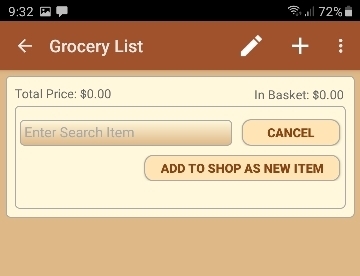 Make A List grocery shopping list app for android. 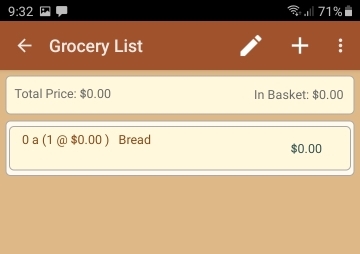 Stick to your budget with this great grocery shopping list app for Android phones. 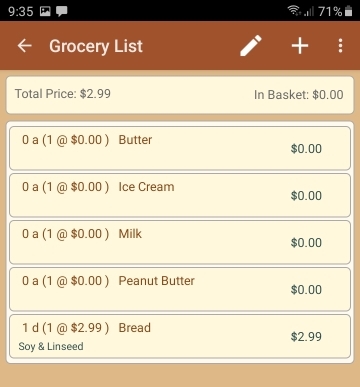 Make A List is a grocery shopping list app for your Android phone that will help you stick to your budget, save you time, and even help save you money. Lists are sorted by aisle and section so that you can acquire all items as you progress through the supermarket and never have to backtrack through busy aisles again. Update prices as you shop so that you always know you are within your budget. If an item has been relocated since you were last in store, update the location as you go so that you know next time where your item has been relocated to. By following your list, you will be able to skip any aisle sections, or even whole aisles that do not contain required items, thereby saving time and also saving money by allowing you to by-pass any 'enticing special deals' in these aisles that you really don't need to buy. Once an item has been selected from the shelves and placed in the shopping trolley or basket you mark it on your list as 'In Basket'. This updates the 'In Basket' total cost at the top (right) of the screen, changes the text color of that item to gray, and changes the background color of the row so that you know at a glance where you are up to. 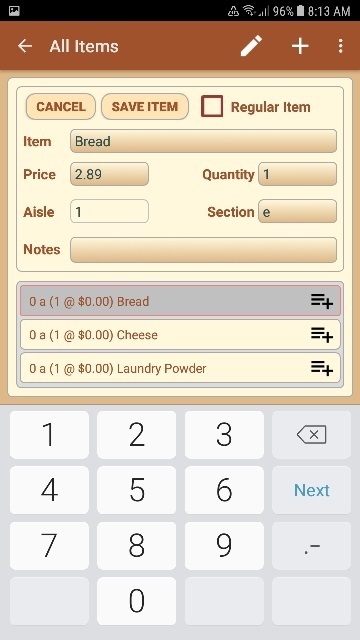 Ever wanted to compile a list of things you didn't buy in one supermarket (for whatever reason - not fresh enough, not cheap enough, not your preferred brand, out of stock) Make A List can quickly transfer any items remaining in your current grocery list (items not marked as 'In Basket') to the grocery list of any other shop you have saved in your app. This function is also useful if you have prepared your list for one shop but find you will now be going to another one. 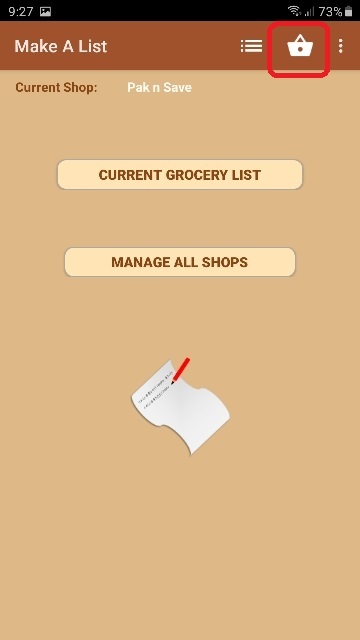 Simply transfer the grocery list to the shop you will now be going to. Once transferred, all you need to do is load the shop you transferred the items to and your sorted grocery list is ready for use. You can add as many shops as you like so that no matter how many supermarkets you regularly go to, you will always have a list that conforms to each shop layout. Shops can be saved to a file in your Downloads folder so that you have an external backup. Once backed up you can easily share your shop layout with friends or family. Want your flatmate, partner, or a family member to pick up a list of items at the supermarket on the way home? Simply email your shop file to them. They can then choose to either load the whole shop file if they do not already have a layout for this supermarket, or they can choose to just extract the grocery list from that file to append to their own shop file. If the person you want to send the list to does not have a MakeAList App on their phone, Use MakeAList to convert your current grocery list to a text file and send them the text file. Most supermarkets these days have fairly long aisles. This makes searching an entire aisle for a particular item extremely time consuming. Also, while you are searching along the aisle, you tend to notice 'great deals' that you really shouldn't waste your money on. Make A List allows you to break aisles up into sections to help locate your items faster. These sections are allocated by you when adding an item to your shop. How many sections you want to use is up to you (up to 5 sections can be used per aisle - a, b, c, d, e ). As an example, say you use all 5 sections and yoghurt was located half way up aisle 2, you would save its location as aisle 2, section c, or 2c. You would then know from your list to make your way to the middle of the aisle before 'searching' for this item. Orientation of the aisle sections is also up to the user. Start with section 'a' at the checkout end of the supermarket, the entrance end, or the deli end. It really doesn't matter what orientation you choose, you can set your Make A List shops up to conform to however you 'see' your shop layout. Below is an image showing a list that has four items marked as 'In Basket' (gray text, light background). In this particular supermarket, the fruit, veg, butchery, deli, and dairy sections all pass around the outside of the aisles, hence they are marked as aisle '0'. Fruit has been delegated to section 'a', veg to section 'b' and so on. As mentioned above, it is completely up to you how you set the aisles and sections of your shops out. The image above shows a typical grocery list. The display for each row shows the aisle number and section, the number of items required @ the user specified price, the item name, and then the total cost (the number of items required multiplied by the price). The price is defined by the user and can represent whatever unit they can imagine. It could represent 'each' item, a packet of items, a bag, or a box. It could represent the weight unit (lbs or kgs) and the user could then weigh the produce at the station and enter the actual weight in the quantity field, resulting in the correct total price for that item. You can also add notes to remind you of other chores that need to be accomplished while out on your shopping trip (as seen below). These notes can be displayed or hidden at will and are not shop specific. In other words, these same notes are available regardless of which shop you have loaded. 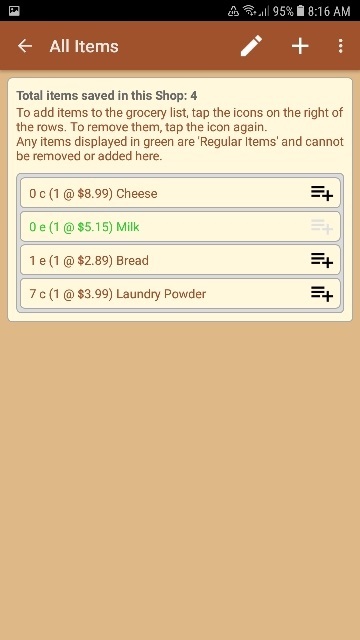 Make A List comes with a default shop containing 4 items (Bread, Cheese, Laundry Powder, and Milk) these items can be edited to your favorite supermarket configuration and prices, or if you would rather start afresh, simply clear the default list, save it as your new shop name, and get started configuring your own shop. You can add and save as many shops as you want. When you first start Make A List, 4 grocery items are auto created so that you can see how the search function works on the Grocery List page. The items created are 'Bread', 'Cheese', 'Laundry Powder', and 'Milk'. 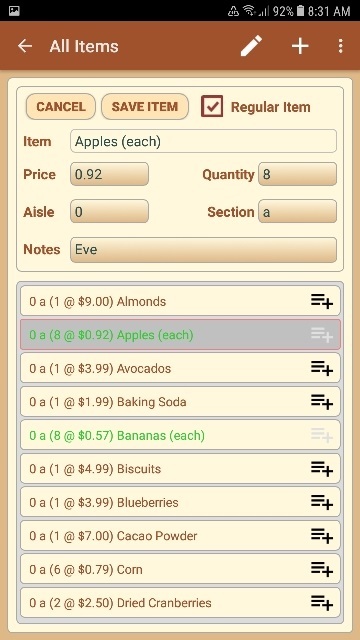 They have their location set to aisle '0', section 'a', as do all new items when they are added to the app. This is because aisle '0', section 'a' will always come out on top of a sorted list so that the new item will be clearly visible for editing when you learn its location and price. To get started, save the default shop as 'your shop name' and then either edit the auto created items, or clear the shop and start from scratch. To save the default shop as your preffered shop name. From the homepage select menu option Manage Shops or just tap the Manage All Shops button. The 'Manage Shops page will appear as shown below. Enter a shop name under 'Save Current Shop (Local Save)' then tap the Save button to the right. If the shop name you save the new shop as differs to whatever is loaded as the current shop, it will add a new shop to your app. The new shop will appear in the list. Select it and tap the Load Shop button. You can now go back to the 'All Items' page and edit the prices and locations to comply with your shop/supermarket. Or, just clear these 4 items and start afresh with your own items. 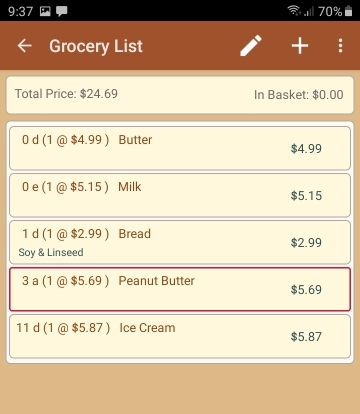 Your Make A List app comes with a default list of 4 grocery items that you can either edit to conform to your preferred shop layout, or simply clear the list and start from scratch entering your own grocery items. The All Items page will appear. 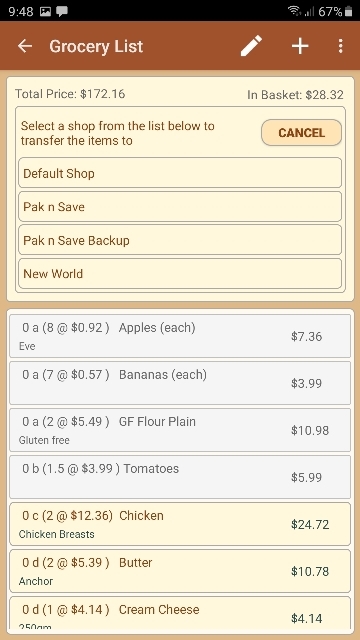 This page displays all items that have been saved to the currently loaded shop (in this case the 4 auto loaded items in the Default Shop) Any items that are saved in the shop (and displayed here) are available for adding to grocery lists. The list is sorted by aisle then section, then item name. In this example, because all row and sections have the default of aisle 0, section a, the list appears to be sorted by item name only. To clear the list, select menu option 'Clear All Items From This Shop'. You will be left with an empty shop as shown below. If you haven't already saved your new shop, go back to the front page and tap the 'Manage All Shops' button. Save the current shop as whatever name you want to give it. Now you are ready to start entering your own grocery items. 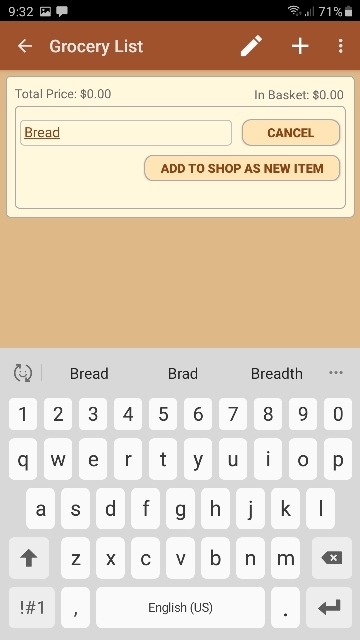 If you want to keep these 4 items in your shop, they can be edited here by selecting the row of the item and then tapping the Edit menu at the top of the page as shown below for the grocery item 'Bread'. The following sequence shows how to edit these items and what to expect. Be aware that these items can also be edited as they are added to the current grocery list. Edit the details as you want and tap the 'Save Item' button to save and close the edit panel. The changes can be seen below. Bread is now sorted to the bottom of the list in aisle 1 section e.
Continue on and edit the remaining items. This will result in the list showing the sort sequence as below, sorted by aisle then section, then item name. 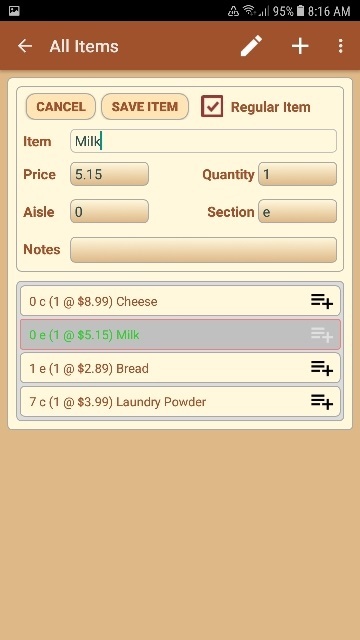 Note in the image above that Milk is displayed with green text signifying it is a regular item. When it was edited the 'Regular Item' checkbox was checked (as you can see in the image below). This means that everytime you clear the grocery list to start a new one, Milk will be automatically added to the new list. You can do this for as many items as you want. The 'All Items' page can be thought of as the shop itself. Here you can view all items that you have saved to the currently loaded shop. The example below shows a shop that contains 308 items. The rows that have a light gray 'Add To List' icon  on the right side of the row have been added to the current grocery list. Note: in the example below, the items have been sorted by description, then aisle and section. 1: Tap the 'Add To List' icon  on the right side of the row (circled in red below). If the icon is black  the item is not already part of the current grocery list and will be added now. The icon color will then change to light gray to indicate its new status. If the icon is light gray  then it has already been added to the current grocery list and will now be removed. The icon color will change to black to indicate its new status. 2: select (tap) the row and then tap a second time, the icon color will change to light gray and the item will have been added to the current grocery list. To remove it from the grocery list, tap the row again. The icon color will change to black again and the item will no longer be included in the current grocery list. The items shown in green signify that they are set as 'Regular Items'. That is, an item that you buy every time you go to the supermarket. 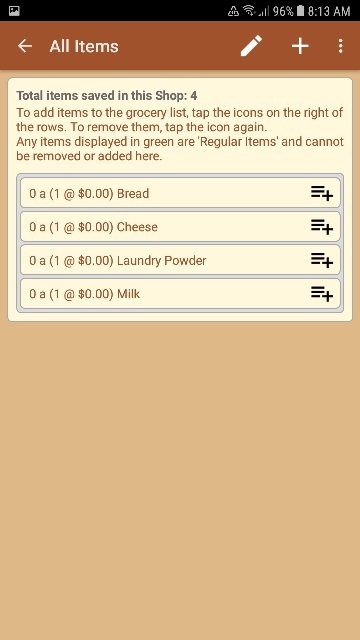 Once you have cleared, or edited the default items, you're ready to start adding your own grocery items. The fastest (and probably easiest) way to enter new grocery items into your new shop is by entering them as you need them - directly into the grocery list for your current shopping trip. To do this, from the homepage, tap the shopping basket menu  (highlighted in the image below) or tap the 'Current Grocery List' button to go to the 'Grocery List' page. The 'Grocery List' page will open as shown in the image below. As in the image, if you have cleared all items from the shop, the list will be empty. To add an item, tap the Add menu  (highlighted above). The Add Item layout will appear as shown below. Type in the name of one of your grocery items. Bread is used in the example below. As you can see, in the example below, the user only had to type 3 characters 'bre' for the shown results to appear. The more you type, the more specific the results are. 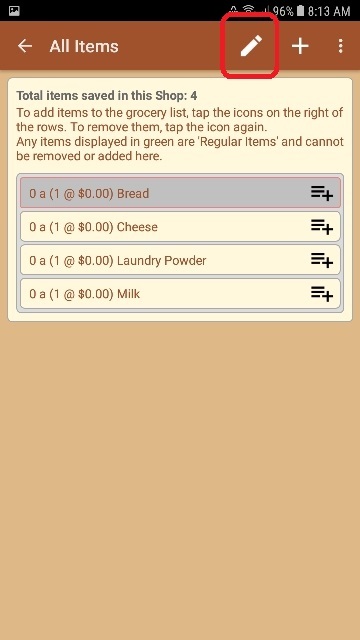 If you have already added 'Bread' items to your shop you will see a list of these items appear as you enter each character, as shown in the example below. To add one of these items to your current grocery list, just select (tap) the item in the list. But, if you are starting up a new shop or adding items that don't already exist in your shop you would just see what is shown below. Tap the 'Add To Shop As New Item' button. This will save it as a new item to the currently loaded shop with default values of Aisle '0', Section 'a', Price '$0.00', Quantity '1'. The item is also added to the current grocery list. 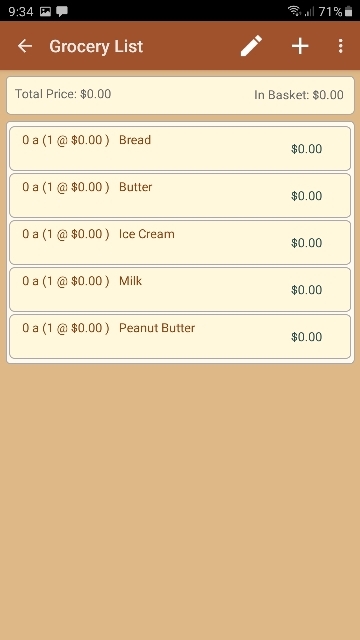 The Add Item layout will disappear and the newly added item is also added to the current grocery list as shown below. Continue adding as many items as you want. Because the items are sorted by 'Aisle', Then by 'Aisle Section', then by 'Item Description', and because all new items added here have the same default values, they will appear in the list sorted by 'Item Description' as seen in the example below. If you know the location and price of these items beforehand, you can edit them as you enter them. Or, just leave it until you get to the supermarket and edit them as you find them in the store. 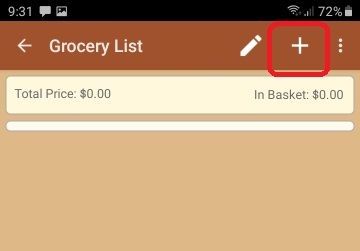 To edit an item, select (tap) the item row in the grocery list and then select (tap) the Edit menu. Then enter the correct details, such as in the example below. When done, tap the 'Save Edit' button. As seen in the image below, 'Bread' has now moved to the bottom of the list because of the new aisle number. The total price at the top of the page has also updated to reflect the newly edited price. Continue editing the newly added items and you will see them all sorted into their correct position according to the locations you enter. The total price will update to reflect the total of all items. As below for this example. To mark an item as 'In Basket', simply tap the total price in the desired row (Circled in red below). The background and text will change to a lighter color and the item total will be added to the 'In Basket' total. As seen below. Tap the total price in the row again to remove it from the basket. You can also select the row in the list, and then a second tap on the row will put it in basket, tap the row again to remove it from the basket. This will make for rather slow going the first time you use the app because the items are not sorted by the correct aisle and aisle sections as you would expect to find them in the store. But, once edited, the items are then available, and will be present in the search list next time you add the item to the grocery list. They will also then be sorted into the correct aisle and section for you to be able to quickly navigate the supermarket. 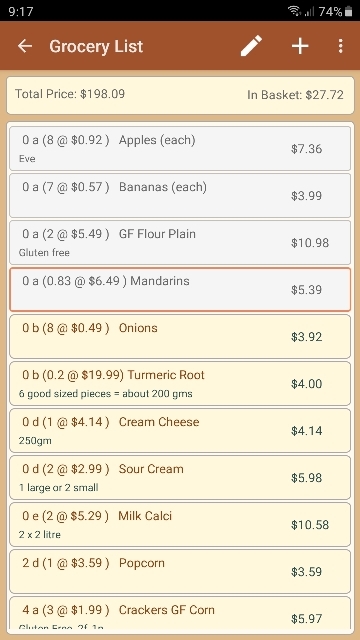 To navigate to the All Items page from the homepage, select (tap) the All List menu to the left of the Grocery List menu  (as shown previously). Items can be added and edited from the 'All Items' page as shown below. To edit an item: first select the item row and then tap the Edit menu to show the add/edit fields displayed below. To add a new item: tap the Add menu  to show the add/edit fields displayed below. If you tap the pencil to edit an item, the currently selected item will be changed to reflect whatever you enter in the fields. 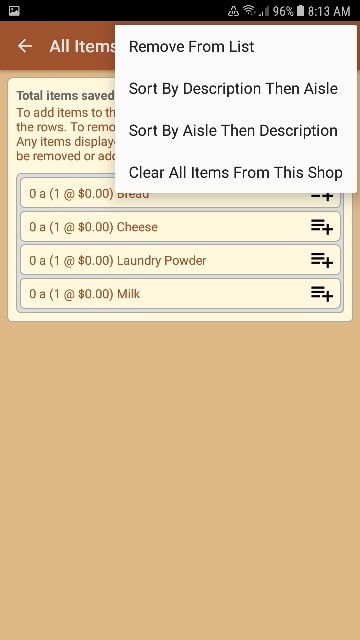 If you tap the add icon, whatever you enter in the fields will be added to the shop as a new grocery item. In both cases you must have entered something in the Item field to describe the item. Make A List will not change or add an item with an empty item description. It will add new items with the same item description as an existing item, so it is possible to double up. To set the item as a 'Regular Item' from the 'All Items' page, select the row and then tap the pencil menu icon at the top of the page. In the Add Edit panel that appears, check the 'Regular Item' Checkbox as shown in the above example, tap the 'Save Item' button to save the change. De-selecting the checkbox will remove the 'Regular Item' status. 'Regular Items' are displayed in green in this list. There are two ways to add an item to the current grocery list. 1: Grocery List Page. As mentioned earlier, the easiest way of adding to the current grocery list is directly from the Grocery List page. 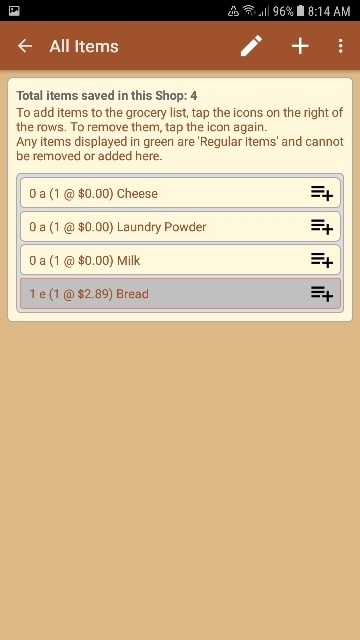 Once an item has been entered and saved in your shop, you can add it to the current grocery list by tapping the Add menu  (highlighted below). Start typing the name of the item you want to add in the text field containing the hint 'Enter Search Item'. 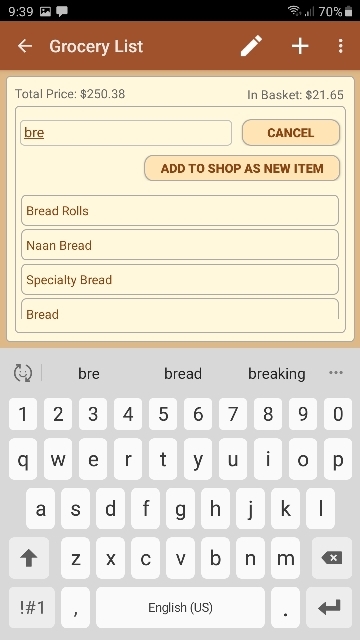 Once you have entered at least three characters, if you have any items in your shop containing that text, it will be displayed in the list as shown below when the user typed 'bre' (presumably looking for bread). Keep entering text to narrow the search down. Obviously, the item will only be available in this list if it has already been saved to the current Shop. Just tap the item in the list to add it to the current Grocery List. 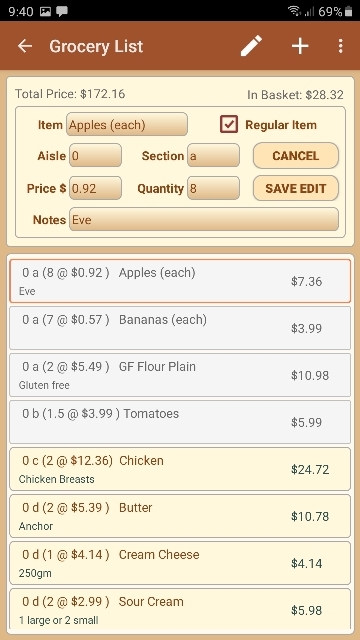 The add / search view will disappear and you will be back in the Grocery List page with your newly added item displayed. 2: Add the item to the current grocery list through the All Items page. 1: Tap the 'Add To List' icon on the right side of the item row (circled in red below). If the icon is black the item is not already part of the current grocery list and will be added now. The icon color will then change to light gray to indicate its new status. If the icon is light gray then it has already been added to the current grocery list and will now be removed. The icon color will change to black to indicate its new status. 2: Select (tap) the desired row. 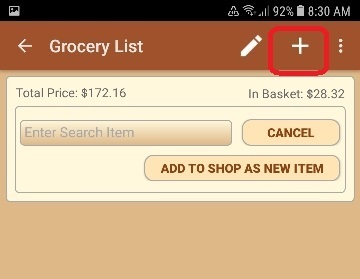 Once the row has been selected, tap a second time, the icon color will change to light gray and the item will have been added to the current grocery list. To remove it from the grocery list, tap the row again. The icon color will change to black again and the item will no longer be included in the current grocery list. 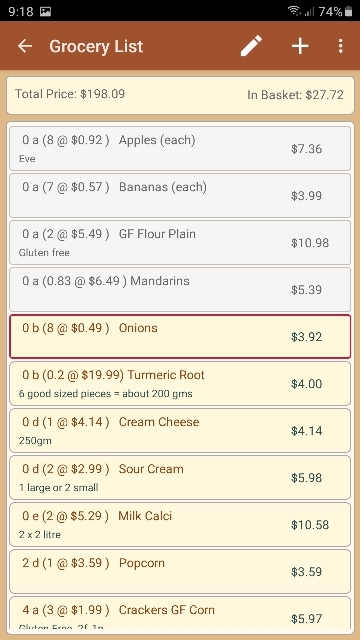 In the example above, the 'Apples' and 'Bananas' items are displayed in green. This tells you that the items are regular items that will be auto added to the grocery list each time a new list is created. To change this, see how to set an item as a regular item from the All Items page. To view the current grocery list, select the Grocery List menu (outlined in red below), or, just tap the 'Current Grocery List' button. The image below shows a typical grocery list. The display for each row shows first, the aisle number and section. 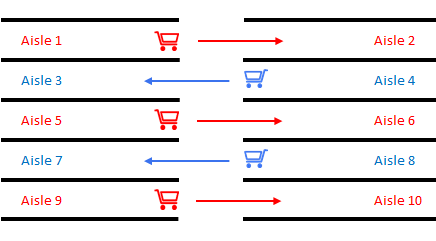 Then in brackets, the quantity @ the user specified price followed by the item name, and then the total cost (quantity multiplied by the price). The 'Total Price' displayed at the top left of the screen is the total cost for all items in the list. The 'In Basket' total is the total cost of all items marked as 'In Basket'. This is useful when you do not buy all items on your list, you still know how much your groceries will cost at the checkout. The easiest way to mark an item as 'In Basket' is to tap the total price in the desired row (Circled in red below). This changes the text color of the item row to Gray with a light background and adds the total cost of this row to the 'In Basket' total at the top of the page. Tap the total price in the row again to remove it from the basket. Tapping each row first selects the row, a second tap marks the selected item as 'In Basket'. Tapping the row again will change it back and subtract that total from the In Basket total at the top of the page. 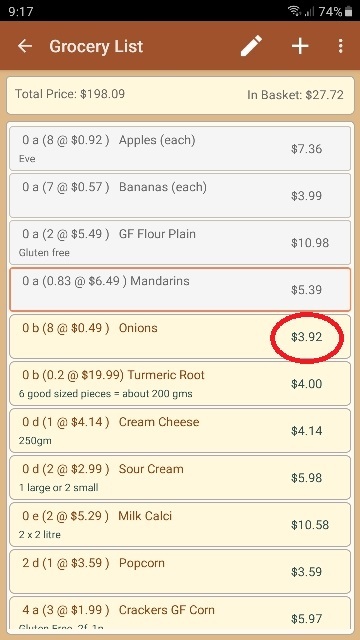 Selecting a row, and then tapping the Edit menu displays a quick edit panel where you can change the price, quantity, aisle, and section. You can also set the item as a regular item by checking the 'Regular Item' checkbox. This will auto add the item to the next grocery list you start. 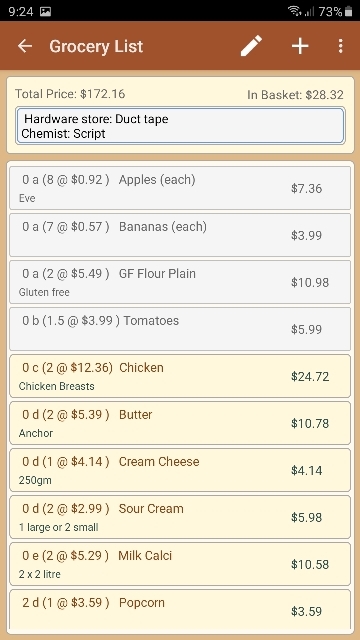 The Menu options for the grocery list page are shown below. 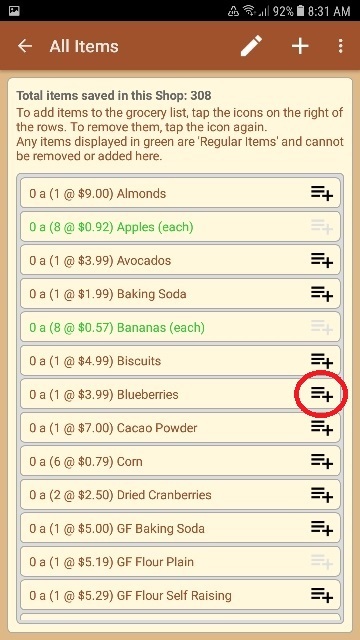 Selecting the Remove From List menu (outlined in red below), removes the selected item from the current grocery list (does not remove it from the shop). The bottom menu item shown in the example above 'Start New Grocery List' when selected, will clear all grocery items from the list and reload the page with any 'Regular Items you may have set up. This option allows you to sort your aisles and aisle sections to help your shopping trip flow more smoothly. Selecting this menu option will open the Sort page as shown below. 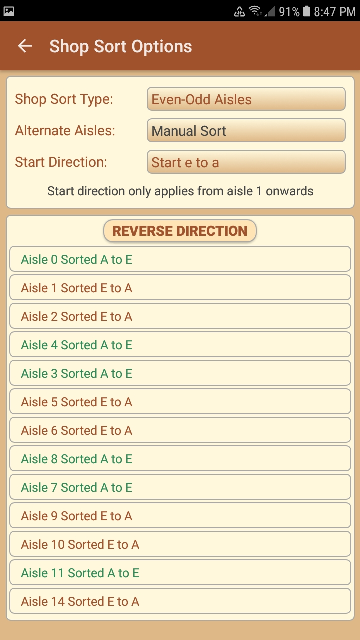 When Shop Sort Type 'Even-Odd' has been selected, the next section Alternate Aisles is set to Manual Sort. This is the only option available when sorting Odd-Even Aisles. 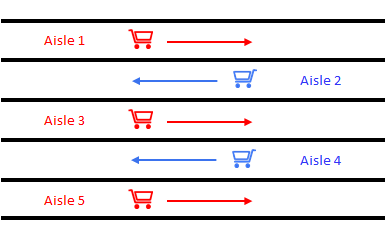 When Shop Sort Type 'Default Aisles' has been selected Alternate Aisles offers three selections. 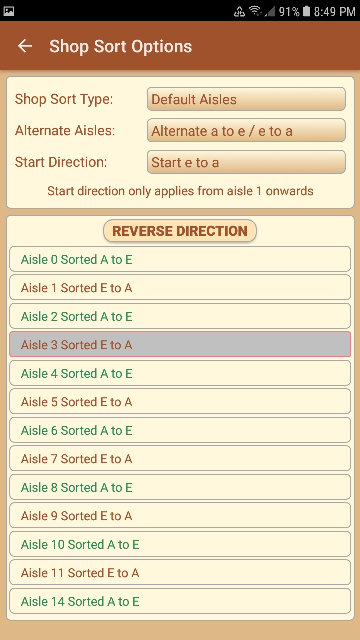 In the example below the user has selected aisle 3, tapping the 'Reverse Direction' button will change this to 'Aisle 3 Sorted A to E', Tapping it again will change it back to 'E to A'. Only aisles that exist in your grocery list will appear here for sorting. 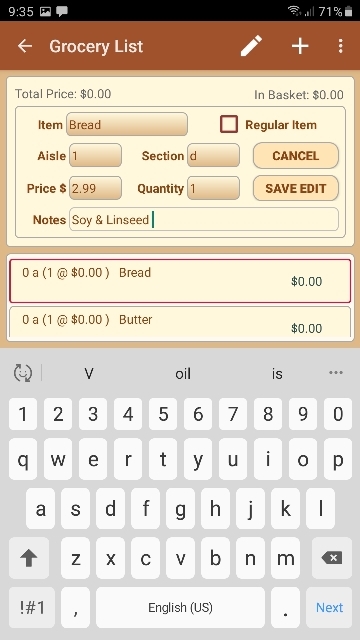 This option shows the notes display at the top of the grocery list. These are the non shop specific notes for reminding yourself of other chores that need to be performed while you are out. When notes are visible, this menu is titled 'Hide Notes' and will hide the display again when tapped. This option allows you to edit your notes. This option appends the items in the grocery list that have not been marked as 'In Basket', to the grocery list of another shop. When you select this option a list will appear with all available shops in your app (all shops you have created and saved) as shown below. Simply select a shop in the list to complete the transfer. The transfer function helps you when you change your mind and decide to buy certain items at another shop/supermarket by transferring these items to another shop that you have setup in your app. 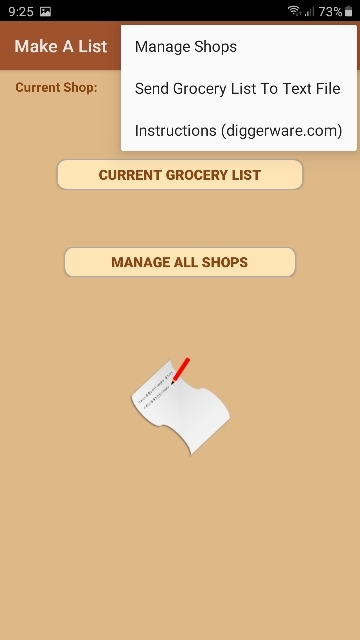 Or, if you are out and find it more convenient to go to a supermarket other than the one you have setup your grocery list for (and that supermarket is setup as a shop in your app), simply transfer the complete list to that shop. Any items that are not found in the shop that you are transferring the list to will be added to the shop using the default Aisle Number '0' and Section 'a'. A note is created to let you know that this item was 'Auto added' so that you know to correct the details when you find the item in that shop. This option clears all items from the current grocery list. Then, any items that were checked as 'Regular Items' will be auto added to the new list. From the Add Edit page select menu option Manage Shops. The Backup Current Shop field at the top of the page is where you enter the filename to use to save the current shop as a text file in the Downloads folder on your device. Tapping the 'Save' button beside this will save the file. Make A List will prefix the specified filename with "MALShop_" to make it easier to identify shop files in your downloads folder. If you do not specify a filename (leave the field blank) Make A List will create a filename containing the prefix "MalShop_" + the current shop name (in the image above "Pak n Save") + the Month and day to save it as. 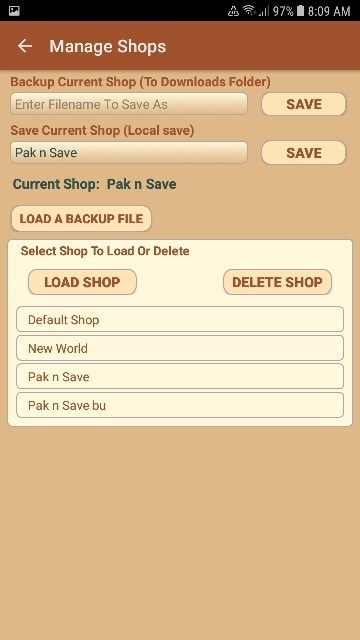 An example of the filename that would be created for the page displayed above would be "MalShop_Pak n Save_Jun10.txt"
The Save Current Shop field below the Backup field is where you enter the filename to use to save the current shop to local storage on your device. Tapping the 'Save' button beside this will save the shop. The default view when the Manage Shops page is first opened shows all available shops in your app (as shown above). Select a shop in the list and then tap the appropriate button to either load it, or delete it from your device permanently. In this view, Make A List has highlighted the shop files in green (Any file that contains the prefix "MALShop_") to help identify shop files. Selecting a shop file from the list and then tapping the Load Shop File button will load this from the downloads folder, convert it into a Make A List shop and save it to your local storage so that it is available for you use. Once the file is loaded as the current shop, you can rename it to whatever you wish by entering a filename in the Save Current Shop (Local save) field and tapping Save. 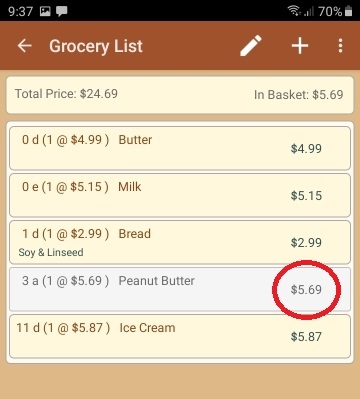 Alternatively, if you already have that shop - or the shop you want to use - in your app and only want the grocery list from the file, select the file in the list and tap Extract Grocery List. This will extract the grocery list items from that file and save them in the current shop.